Lock in a great price for Madrid Marriott Auditorium Hotel & Conference Center – rated 8.9 by recent guests! One of the finest aesthetically pleasing modern hotel with Auditorium and conference center, we have stayed. Restaurant was excellent. This is the best Marriott stay in my experience. Will highly recommend to every one. Great staff, clean and comfortable room. Excellent pool and area to lounge near it. Decent food. We arrived at midnight following a flight from Tenerife and on an overnight layover to Chicago. We were happy the Sports bar was open for food and drinks. The hotel was beautifully appointed, room had everything we needed, transport from and to the airport was spot on. The common areas were lovely. Our room was nicely furnished. I like the hardwood floors. People were very nice and helpful. Breakfast is really amazing and the staff are very kind and helpful. The hotel was huge in size and was very clean and overall well maintained. Staff were very friendly, and the breakfast was worth every penny. It’s very well run and tremendous facilities, rooms are very comfortable and high end. Great bar. Close to the airport with shuttle service. New hotel and grand feeling. 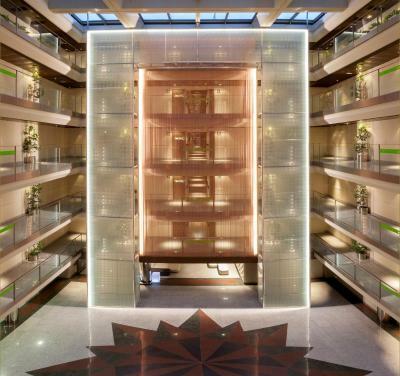 Madrid Marriott Auditorium Hotel & Conference Center This rating is a reflection of how the property compares to the industry standard when it comes to price, facilities and services available. It's based on a self-evaluation by the property. Use this rating to help choose your stay! One of our top picks in Madrid.Part of the Principe Felipe Conference Center, Madrid Marriott Auditorium Hotel & Conference Center is within 10 minutes’ drive of the IFEMA Trade Fair and Madrid-Barajas Airport. Rooms offer satellite TV and free high-speed WiFi. 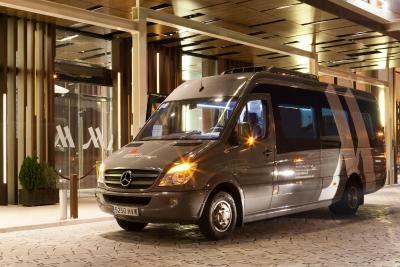 The hotel provides a free airport shuttle service every 30 minutes approximately, running to all terminals. Set next to the A-II Motorway, the hotel also has good access to central Madrid. During the main IFEMA Trade Fairs the hotel can provide a free transport service upon request and subject to availability. A free shuttle service to Plenilunio Shopping Center is also available. Madrid Marriott Auditorium Hotel & Conference Center's Kalma restaurant serves à la carte Mediterranean cuisine. There is also a buffet restaurant, an elegant lounge bar and a piano bar on site. 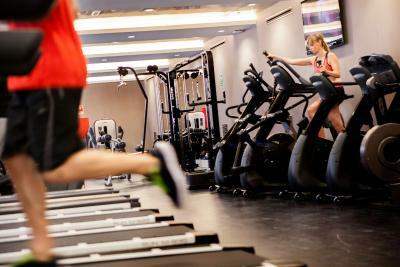 A Fitness Center with sauna and a fully equipped gym is available for clients 24 hours per day 7 days per week. 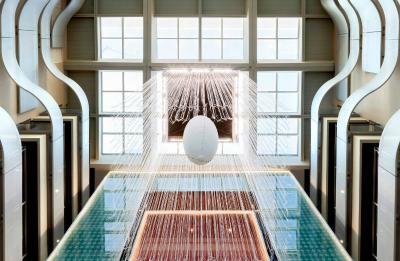 An outdoor and and indoors swimming pool are featured and they are available from 09:00 to 21:00. San Blas is a great choice for travelers interested in monuments, sightseeing and shopping. When would you like to stay at Madrid Marriott Auditorium Hotel & Conference Center? This double room features a mini-bar, electric kettle and air conditioning. This triple room features satellite TV, air conditioning and a minibar. This twin room has a mini-bar and air conditioning. This suite features air conditioning and mini-bar. This twin room has air conditioning, mini-bar and satellite TV. For any additional days, please contact the property directly. 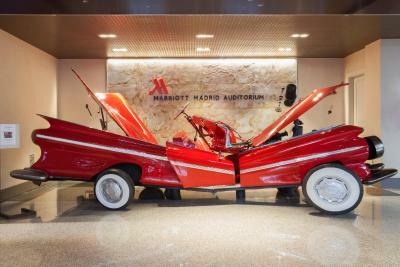 House Rules Madrid Marriott Auditorium Hotel & Conference Center takes special requests – add in the next step! Madrid Marriott Auditorium Hotel &amp; Conference Center accepts these cards and reserves the right to temporarily hold an amount prior to arrival. Madrid Marriott Auditorium Hotel & Conference Center accepts these cards and reserves the right to temporarily hold an amount prior to arrival. Please note that the fitness center is open 24 hours a day. The airport shuttle service operates daily from 05:00 until 01:30. Detailed timetables are available from the hotel. 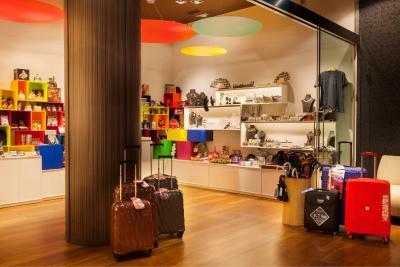 The hotel also offers a shuttle service to Plenilunio Shopping Center. Timetables are available from the hotel. Please note that the maximum occupancy for all rooms is 3 guests. The quality of the food in the room service is horrible! Shuttle was full for the time I needed to leave for airport. Maybe have shuttles more often. This was one of the reasons I stayed at the hotel. Our room was too away from the entrance as far as from reception/restaurant. The room was for two persons but there was set of toiletries only for one. The window was small and the view was on warehouses. Also there was not shoe set and vanity kit at all. The airport shuttle is the easiest way to get to the hotel and back in any time. It arrives and departures every 30 minutes and stops in every Terminal. Check in was fast. Included breakfast was very delicious. The balcony is nice. The room was clean. The long distance to city center. No pick off from the hotel for touristic tours. Big and comfortable room. Very good breakfast. The distance to the city centre. Friendly and helpful staff. The gym being open 24 hours a day. The shuttle bus could have been larger. It could not hold all the people waiting for a 9 am trip to the airport. Room was spacious and quiet and king size bed was very comfortable. Coffee and tea provided in the room. Hotel was located about 15 minutes from the airport, which was accessed by their free shuttle. The hotel also provided a free shuttle to the local shopping mall. I especially enjoyed the large pool. Food in the lounge/ Bar closer to get to airport it takes 30 minutes. Bed was sooo comfortable. Nice to have some coffee and tea in the room. The staff was so welcoming and the restaurant was the excellent!! !